You can now use tokens in your 3rd party pixel and postback urls in step #1 of the setup process. They work just like the tokens you've been able to use in your affiliate links in step #3 when setting up your Campaigns. One thing early beta testers have been using this feature for, is the ability to fire 3rd party pixels or postbacks from traffic sources that generate a unique click id. Here's another example using the [[payout]] token. 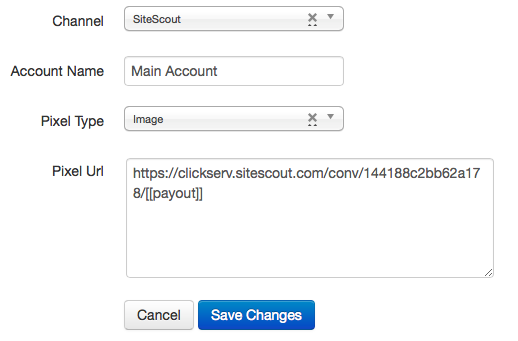 Sitescout has the ability to accept a dynamic conversion value, so the following would fire the sitescout image conversion pixel with the actual value of the lead. 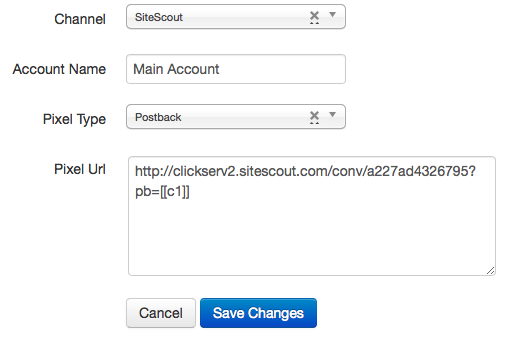 If you are already a ClickServer202 client, this feature is available to you right now. Not yet using ClickServer202? Upgrade from Prosper202 now, and enjoy a 14 day free trial.